Smartphones help us check our email and upload photos, watch movies and even navigate our way through France. 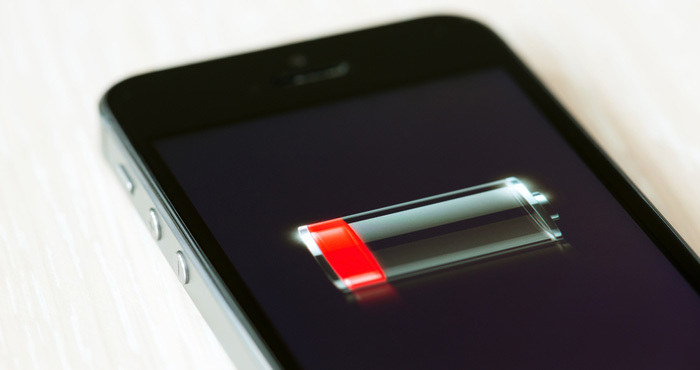 Given all that, it might not come as a massive shock when your phone dies after an intensive day of use, but it's still a major inconvenience if it dies when you're still miles from your destination or just minutes away from taking an important phone call. Though the iPhone 8 and 8 Plus boast the best battery life yet of any Apple phone, if you use your iPhone a lot, you probably want its battery to last longer. The most common battery drainers are the features that make smartphones so great: GPS that lets you post geotagged photos and call taxis, internet connections that let you stream YouTube on the go and apps that work in the background to alert you to everything from friend requests to your preferred airline's flash sale. We know you love your smartphone and all its smart features. That’s why our tips for saving your iPhone’s battery power focus not on turning off these essential features but on using them more efficiently. Check what's sapping the battery. In iOS 11, head to Settings > Battery and scroll down to see a list of which apps are using what proportion of the battery power when the phone isn't charging. Shut down background app refresh for apps that don't matter. If you discover that the most battery-sucking apps are apps you really don't need updates from (for example, I found that eBay was siphoning 11 percent of my battery power, compared with WhatsApp, which only used 2 percent), head to Settings > General > Background App Refresh to manually toggle each app's auto-refresh. This prevents apps from constantly checking their servers for updates or notifications to push to your phone — another battery-drainer. Even if an app doesn't appear on the list of apps using your battery power, it's worth going through the list and turning off background app refresh for apps you don't use. Check how much battery power notifications are costing. Push notifications are real-time alerts from an app, useful for new email, less so for new coins in Candy Crush Saga. Each new notification uses battery power to light up your home screen and pop up an alert. You can see how much battery power your notifications are costing by checking what percentage of the battery is being taken up by Home and Lock Screen (Settings > Battery). This indicates how many times the display is being awakened, either by your turning it on or by notification alerts. If Home and Lock Screen is hoovering up far more power than any other app, your battery would probably benefit from disabling push notifications from some apps. Stop notifications from apps that overdo it. Each notification wakes the device for five to 10 seconds, costing your battery life five to 10 seconds. If you’re receiving Twitter mentions, new email, game alerts and Facebook likes or mentions, it isn't hard to rack up 50 notifications; that’s four to eight minutes off your battery life. And that doesn’t take into account updates from the apps you don't actually use. To turn off extraneous apps, head to Settings > Notifications, and scroll through the list to manually disallow alerts app by app. Turn off Push email. When you set up your email account/s, you had the option to turn on Push email, where your phone checks for email in the background and downloads it for you. This constant polling for emailing can drain your battery. Instead, head to Settings > Accounts & Passwords > Fetch New Data and turn off Push. Then for each account, you can select how often your phone will reach out for updates or whether you'll need to manually check. Enable airplane mode in areas of poor reception. When your iPhone detects a low signal, it increases power to the antenna so it can stay connected to the cellular network. If you're frequently in an area where the signal is so bad that calls rarely get through or if you don't need to make or receive calls, turn on airplane mode by swiping up from any screen and tapping the airplane icon. This disables all connections, but you can re-enable Wi-Fi by tapping the icon. Deal with the display. A dim screen uses less power, so if you find your battery is on its last leg, swipe up from any screen and drag the brightness slider all the way to the left. You can also turn on Auto Brightness (Settings > General > Accessibility > Magnifier > Auto-Brightness) so that the iPhone automatically adjusts the screen brightness depending on how much power you have left. Use Wi-Fi instead of cellular internet. Apple suggests using Wi-Fi where you can because it uses less power than a cellular connection. Turn off wireless connections you're not using. Bluetooth uses battery power by scanning for nearby Bluetooth devices to connect to. The same goes for Wi-Fi and AirDrop, the feature on iPhone 5 and newer that connects the phone to nearby Apple devices. If you're not using these connections, turn them off by swiping up from any screen (or swiping down from the right corner for the iPhone X) and tapping the relevant icon. Tweak which apps get to use your location. If you head into Settings > Privacy > Location Services, you'll see a slew of apps that are tracking your location. Some, like Google Maps and Instagram, have obvious functional reasons for using your location, but others may simply use location services for targeted advertising or unnecessary features they call “delivering a better experience.” Chrome uses location information to deliver tailored content as well as ads, while apps from my bank and Starbucks probably use it for advertising or customer profiling. Location tracking eats away battery life, so turn it off or choose "While Using the App" for the apps that don't need it for a good battery boost. Update to the latest OS. If your iPhone supports it, update to iOS 11, which features the best power management features yet. In general, OS updates bring tweaks that improve your phone’s performance, so it's a good idea to check if there's an update you haven't downloaded (Settings > General > Software Update). Don't quit apps in multitasking. You'd think flicking away an unwanted app in the iPhone's beautifully smooth multitasking view (accessed by double-tapping the Home button) would help save power, but it actually costs battery life. Flicking away an app closes it and takes it out of the phone's RAM (easily accessed memory). The next time you need the app, the phone has to load it all over again, using more power than it would have to simply pull the app out of its open stasis. In any case, iOS automatically freezes apps when they're not being used, so leaving an unused app open isn't a battery crime. Keep the phone cool. Excessive heat can damage the battery's capacity and shorten how long it can power your device on a single charge. Apple suggests http://www.apple.com/batteries/maximizing-performance/ that you avoid exposing your phone to temperatures above 95 degrees Fahrenheit (35 degrees Centigrade), so don't leave your phone on your car dashboard on a hot summer's day, as distant a dream as that may seem at the moment. When charging by computer, make sure the computer has power. If you're charging your phone by USB on a computer and the computer goes into sleep or standby mode, it could actually drain your iPhone battery. Make sure the computer is plugged in and that the USB port remains active even if the computer goes to sleep. Some cases aren't made for charging. Certain styles of cases may insulate your iPhone so well that it causes the phone to heat up as it charges. Check your phone while it's charging, and remove it from its case if it's heating up. Store your phone at 40 percent power. If you're not using your phone for more than a few days — say, if you're off on a week-long meditation retreat — power it down after charging it about halfway. An empty battery could fall into a state Apple refers to as “deep discharge,” rendering it incapable of ever holding a charge again. On the other hand, turning off your phone for more than several days at 100 percent battery power can also damage the battery capacity and shorten battery life. If you're storing your phone for longer than six months, Battery University recommends charging it to 40 percent before storing it. Apple recommends turning your phone on every six months and making sure your phone is charged to 50%. Is your battery draining too fast? If you're using iOS 11, there's an easy way to check if your battery drain rate is normal. Head into Settings > Battery Usage and tap the clock icon next to "Last 7 Days." Scroll all the way to the bottom and note the usage and background times. Then turn your screen off for five minutes. When you come back, check the usage and standby again. If your device is going into sleep mode properly, the usage time should not have changed, while the standby time should have increased by five minutes. If you find your usage time has gone up by a minute or more, your device isn't going into sleep mode properly and you may need to take the phone in for repair. Once a month or so, let the battery drain out completely so the screen goes dark. You won’t lose any data even if you are in the middle of typing. This tip also goes for any device that uses a Lithium ion battery (Li-ion, LIB). I have always understood that it’s better to leave your device on (i.e. rarely turn it off). However, the reason for this is not to gain longer battery life, but to extend the life of the device as a whole. Lithium ion batteries all have a limited number of charge cycles. So the more you use your battery and then recharge it, the fewer life cycles it will have left. So if you phone is not in use (e.g., overnight), it would be better for the battery if you kept it off until you needed it again. As far as turning it off and on extending the device life as a whole, that advice dates back to the old PC days when it was believed the stress placed on the hard drives and other components when rebooting could decrease their life. Since iPhones (and other smartphones) have no moving parts that would be affected by rebooting, I see no reason to believe that turning your device on and off would have any impact on service life. Is it true that if you leave your iphone unplugged and let the battery drain to very low, rather than have it plugged in at all times, does this save the battery life of the iphone? Does locking the rotation(so the screen doesn’t rotate when tilted) on your iphone save battery life? The phone has internal gyros to detect rotation. Turning on screen rotation lock “may” turn off the gyros for certain applications, but whether that saves any meaningful amount of power is questionable. While I couldn’t find any specific measurements, the gyros likely consume very, very little power. The screen itself, when on, will be consuming far more power than the gyros that affect rotation. So I would opt for the convenience of rotation over the likely negligible extension of battery life. This feature no longer resides under Display & Brightness. The one under Magnifier says Adjust brightness and contrast based on ambient light settings. The one under Display Acc. says Turning off auto-brightness may affect battery life! Seems like you might want to turn it ON in both locations! Watching videos on embedded devices like mobiles and tablets does take a toll on the battery , because of the obvious reasons ! 1. Software not well optimized. 3. Playing 4K content is resource intensive.